Naper Settlement's blog will feature special events, historical happenings and interesting tidbits about Naperville's only history museum. Pictured left to right: Cara Grandys, Steven Daniel, Jim Baer and Ginger and Gary Fry. This holiday season, Naper Settlement's curatorial team created the upcoming holiday-themed, post-World War II exhibit, “Home for the Holidays: Christmas in the Fabulous 1950s,” on view now till Dec. 24. With the help of some amazing collectors, visitors will need to keep an eye out for a few remarkable items on loan from Naperville residents and local collectors, Gary and Ginger Fry. The Frys have contributed to Naper Settlement’s holiday exhibits for the past two years, and began collecting antique items when they got married 48 years ago. Ginger says they were so in love with antiques they registered their wedding with an antique dealer for crystal wine and water goblets, rather than with a department store. Gary owned the Antiques on Jefferson in Naperville for 8 years, and it was there the Frys saw a feather tree decorated with tiny German ornaments. They purchased the tree, and soon after became interested in learning more about antique Christmas items. After they retired, the Frys joined the Golden Glow of Christmas Past, a non-profit organization focusing on education and history of antique and vintage Christmas items, which was founded by a Christmas light collector from Chicago. The Frys reached out to other members of the organization to help with Naper Settlement’s holiday exhibit who had Christmas items from the 1950s. Although the Frys still add to their early antique collections if they stumble upon something unusual, Ginger says antique Christmas items are their most recent love. They first began collecting glass ornaments, but gradually began adding ceramic and china pieces, that include candy containers, Santa figures, snowmen and angels. When asked what kind of advice Ginger would give to someone who wants to start collecting antiques, she recommends buying items "that you love and that will make you smile." Ginger says collecting is also a great social activity. Ginger worked as a teacher and always had a love for children’s books, so some of her favorite Christmas books from the 1950s will be on display. 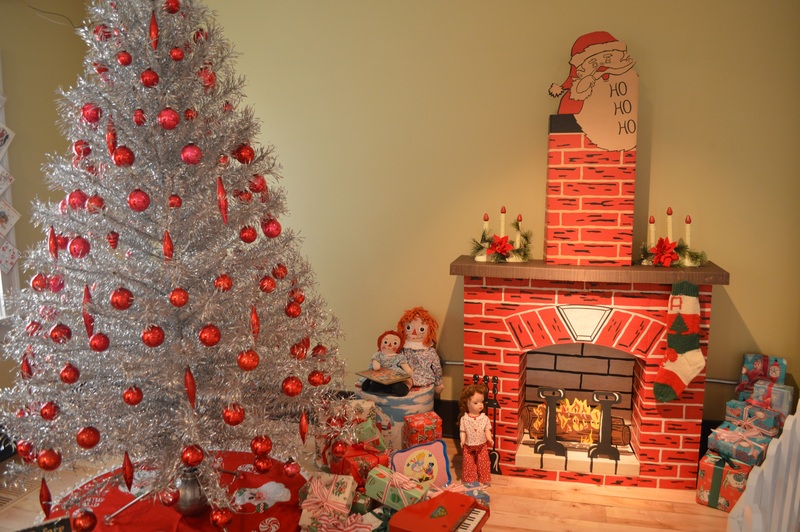 The Frys have also loaned a variety of miniature stockings and helped to recreate a typical 1950s living room with their stainless steel Christmas tree complete with a revolving color wheel. Naper Settlement’s holiday exhibit, Home for the “Holidays: Christmas in the Fabulous 1950s,” will be from Nov. 14 to Dec. 24 and will be open during winter museum hours. Admission during Christkindlmarket is free. Underwritten by Ronald & Claudia Stenger. Visit our website or call (630) 420-6010 for more information. In Naper Settlement’s journey to preserve the city’s rich agricultural history and explore the importance of locally-sourced produce, the Kellers stood out as an established farming family that has been in Naperville since 1852 and in the past 20 years have created three very successful farmstands in Naperville, Plainfield and Oswego, known as Keller’s Farmstand. The Keller’s originated in Bavaria, Germany and purchased land along River Road on the north side of Naperville. During hard times, the first Frank Keller sold the farm and began work at The Naperville Bank, but after some time returned to farming and bought a new farm along Ogden Ave. It was used primarily as a dairy operation, but the farm also had a range of crops including apples, grapes, raspberries and potatoes. During the Great Depression, the Keller’s put up a table alongside Ogden Ave. which was a tremendous success. In 1966, Frank Keller Jr. sold the Ogden Avenue farm and purchased a larger farm on 95th Street (now named Knoch Knolls Road). Keller Jr. then retired from farming, allowing his two sons, Frank III and Ray, to raise corn, soybeans, oats, hay and cattle. The dairying was discontinued. After Frank III’s son, Frank Keller IV, graduated college, he decided to join the Peace Corps. He ended up working with farmers in southern Africa teaching them how to grow vegetables. In 1991, the first Keller’s Farmstand opened along 95th Street and shortly after the second location opened on their Plainfield farm. After a four-lane highway was planned to cut through the Keller’s Naperville farm, the family decided to acquire land in Oswego to make up for the loss. In 2008, the Keller’s decided to open their third farmstand in Oswego. This is where Keller IV started to grow specialty crops such as sweet corn, pumpkins and apples. Keller’s Farmstand also welcomes schools to educate the students on farming and show them how great the United States agricultural system is. For more information on the Keller Farmstands, visit their website at www.kellersfarmstand.com. If you’d like to learn more about Naper Settlement’s Agricultural Interpretive Center and its goal to preserve the region’s agricultural history, visit our website at www.napersettlement.org/aic. Naper Settlement’s 16th annual Wedding Showcase is only 3 months away! Mark your calendars for Saturday, January 6th from 10AM – 3PM, for a day full of one-on-one consultations with some of the best businesses in the industry. We look forward to helping couples plan their special day and getting the community involved. Wedding Showcase vendor applications were sent out last week and some of the first few that registered play very important roles in any wedding. I asked our returning vendors why they like participating in Naper Settlement’s Wedding Showcase, below are some of their answers! “The Naper Settlement Wedding Showcase is so much fun for me as a vendor. I get to meet with wonderful people & play them songs they'd like to hear, the best way for me to display my service proposition. In my first year of being a part of the Showcase, I secured many bookings from couples in attendance, so I know how effective it is from a marketing standpoint. “ – Jim Perona of Jim Perona Guitar, Inc. If you are interested in booking a display table at the 2018 Wedding Showcase, please fill out our vendor application and email us at weddings@naperville.il.us. For more information, call us at 630.420.6012. Space is limited, call early! This blog was written by Naper Settlement's Guest Services Representative, Grace Michalak.